For the past 15 years, Canadian mining firm Gabriel Resources has been trying to obtain a permit to extract 300 tonnes of gold from underneath Roșia Montană, a picturesque village in western Romania, with a population of almost 4,000 people. But today, the Romanian government has added the village and its surroundings to their official nominee list for the UNESCO world heritage site. This decision comes a few weeks after Roșia Montană was declared a site of historic interest by the Romanian Ministry of Culture, and stands as a testament to the power of peaceful protest. The story of how the government changed its mind starts with the story of the Romanian people speaking up against irresponsible corporations and environmental destruction. 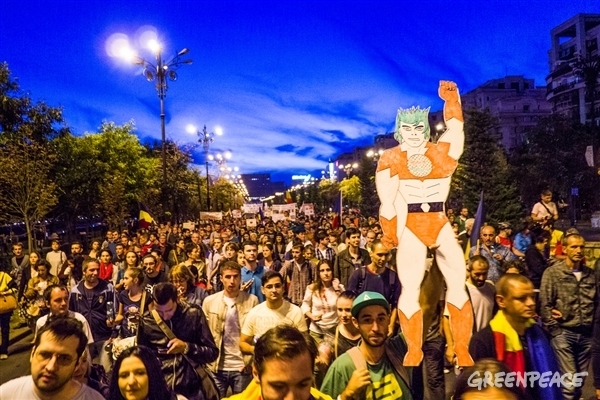 In September 2013 Romania saw the biggest street protests since the 1989 Revolution. Thousands of people, mostly young people, took to the streets holding up signs saying “The corporation doesn’t make the legislation”, “Corruption = Cyanide” and “We want nature, not cyanide”. They were speaking up for Roșia Montană, a little village in the north of Romania that sits on top of a gold mine. Since 2001, Canadian firm Gabriel Resources had been in negotiations with the Romanian government for the rights to build a cyanide gold mine in the beautiful, resource-rich area of Roșia Montană. Their plan was to relocate the local residents and to pump 12,000 tonnes of cyanide a year into an open-pit mine to extract 300 tonnes of gold. Local authorities and residents had been successfully opposing the project for years. But in August 2013, a new law was drafted which planned to grant unconstitutional rights to private companies, including the right to issue compulsory purchase orders to residents who refused to sell their houses and lands. This put Roșia Montană directly in the sights of Gabriel Resources, who would finally be able to force residents from their homes, and begin to pump tons of cyanide into the earth in the search for gold. There was little news of the vote in the mainstream media, but social media amplified the voice of independent journalists and local NGOs, to show how Roșia Montană was at risk of losing the battle against the mining company. Discontent at this injustice grew across the country, and on September 8th 2013, 15,000 protesters marched through Bucharest, with about 5,000 more following in other cities around the country. Protests and marches were scheduled every day for weeks to follow. The “hipster revolution”, as the media called it, was the coming of age of the Romanian civil society. Never before in Romania’s short democratic history has an issue raised so much public support and created such healthy debate amongst its citizens. The post-communist generation had united for the first time since the revolution, and had done so to rally behind an environmental cause – to protect Roșia Montană and its residents from another ecological disaster like the Baia Mare cyanide spill. What can we learn from Romania’s new found civil strength? That people care about injustice, and care about environmental issues. That by using new tools such as social media, we have the power to spark and spread information, and to inspire peaceful protest. We learned that we have the responsibility to hold the people in charge accountable for their decisions. And that if we take that responsibility seriously, we can drive change. The fight to save Roșia Montană happened on the streets and on the internet. It’s motto was #unitisalvam - Romanian for “United, We Save”. In these times of corporate greed and environmental destruction, this is a motto which can inspire us all. This past weekend thousands of people joined hands and formed an eight kilometer Human Chain across the border of Germany and Poland to protest against lignite mining in the area. 30 different nationalities traveled from cities all over Europe to be there. It was an extraordinary event that brought together Greenpeace volunteers, environmental grassroots organisations and thousands of members of the local community. I left for the Human Chain early Friday morning and joined a bus of Belgian and Dutch Greenpeace volunteers. We traveled for more than half a day and reached the campsite in Kerkwitz, Germany on Friday night. Our camping neighbours were other volunteers from Luxembourg, France, Sweden, Finland, Norway and Austria. The rest of the volunteers were staying at another campsite, just two kilometers away. Other activists were camping separately in the surrounding forests, across the Polish border. Aside from Vattenfall’s giant open pit mine at Cottbus-Nord. Vattenfall plans on building five more plants in the area. This means that dozens of villages will be bulldozed and some 6000 people will lose their homes and livelihoods. On the morning of the event, all the activists gathered for a briefing given by a Greenpeace campaigner at the campsite. Here, the owner of the campsite stepped forward with a piece of paper in his hands. He wanted to say a few words and started by apologising for his English. He was nervous to speak in a foreign language in front of a crowd. His voice was shaky and his eyes were pointed towards his feet. He wanted to tell us “thank you” for coming. He was truly impressed by the fact that we all came from our warm homes, hundreds and thousands of kilometers away, to this remote part of Germany, in the middle of a chilly forest. That chilly forest was his home and he had lived there for the past 40 years and wished to live there for 40 more years together with his family. His voice broke completely and his eyes teared up. So did everyone else’s in the audience. This is just one of the thousands of people who risk losing their homes in Lusatia because reckless governments and greedy companies play with people’s lives and the climate. The urgency of what is happening in Lusatia isn’t just about the environment, it’s about the people that call that place home. Yes, there were 7,500 people who joined hands and formed a Human Chain on August 23rd. Yes, many of them were activists from Greenpeace and other environmental organisations. But most of them were the people of Lusatia who welcomed us and took care of us and treated us like families. This weekend in Lusatia we all felt like home. And there’s nothing that makes a place home like people. Let’s not forget about the people. Things that happen. Things that don't happen. And everything in between.